Visa requirements for French citizens are administrative entry restrictions by the authorities of other states placed on citizens of France. As of 26 March 2019, French citizens had visa-free or visa on arrival access to 187 countries and territories, ranking the French passport 3rd in the world in terms of travel freedom (tied with Danish, Finnish, Italian and Swedish passports) as well as the joint 2nd most powerful passport in Europe and the EU according to the Henley Passport Index. Additionally, as of 5 April 2019, Arton Capital's Passport Index ranks the French passport 4th in the world in terms of travel freedom, with a visa-free score of 165 (tied with Belgian, Greek, Maltese, Nowegian, Japanese, Irish and United States passports). Visitors who have been granted an online pre-visa or have requested such pre-visa from the consulates of Angola abroad, are then issued with a visa on arrival at the country's border check points. For a maximum total stay of 90 days within a one year period. Besides having printed confirmation that a visa will be issued upon arrival, passengers must: have a return/onward ticket, and have a hotel reservation confirmation. eTA not required for French living in Saint-Pierre and Miquelon going to Canada. Must register online at least five days prior to arrival. Visa not requiered if Passengers with a V.I.P invitation letter. Passenger with a letter (Visa Volant) issued by the Ministry of Interior and Security can obtain a visa on arrival. Visa not required if Passengers traveling as tourists on a charter flight. Also visa on arrival (cost:50 USD or 40 €). eVisa available for both tourism (allowed stay is 28 days) or business (allowed stay is 70 days) purposes. Visa on arrival when travelling on business valid for 30 days. Visa on arrival when travelling as part of a group through a designated tour operator. Available at Berbera, Borama, Burao, Erigavo and Hargeisa airports. 30 days, available at Bosaso Airport, Galcaio Airport and Mogadishu Airport. Maximum two visits annually if not arriving by air. Determined at the port of entry. Also eligible for a universal visa allowing access to Zimbabwe. Also eligible for a universal visa allowing access to Zambia. Republic of Crimea Visa required Visa issued by Russia is required. Nagorno-Karabakh Republic Visa required Travellers with Nagorno-Karabakh visa (expired or valid) or evidence of travel to Nagorno-Karabakh (stamps) will be permanently denied entry to Azerbaijan. South Ossetia Visa not required Multiple entry visa to Russia and three-day prior notification are required to enter South Ossetia. Sudan Travel permit required All foreigners traveling more than 25 kilometers outside of Khartoum must obtain a travel permit. India PAP/RAP PAP/RAP required Protected Area Permit (PAP) required for whole states of Nagaland and Sikkim and parts of states Manipur, Arunachal Pradesh, Uttaranchal, Jammu and Kashmir, Rajasthan, Himachal Pradesh. Restricted Area Permit (RAP) required for all of Andaman and Nicobar Islands and parts of Sikkim. Some of these requirements are occasionally lifted for a year. Sabah and Sarawak Visa not required These states have their own immigration authorities and passport is required to travel to them, however the same visa applies. Maldives Permission required With the exception of the capital Malé, tourists are generally prohibited from visiting non-resort islands without the express permission of the Government of Maldives. Turkmenistan Special permit required A special permit, issued prior to arrival by Ministry of Foreign Affairs, is required if visiting the following places: Atamurat, Cheleken, Dashoguz, Serakhs and Serhetabat. Yemen Special permission required Special permission needed for travel outside Sana’a or Aden. Bermuda Visa not required Up to 6 months, decided on arrival. San Andrés and Leticia Tourist Card on arrival Visitors arriving at Gustavo Rojas Pinilla International Airport and Alfredo Vásquez Cobo International Airport must buy tourist cards on arrival. Montserrat Visa not required 6 months. Ashmore and Cartier Islands Special authorisation required Special authorisation required. Holders of various categories of official French passports have additional visa-free access to the following countries - Algeria (diplomatic passports), Azerbaijan (diplomatic passports), Kazakhstan (diplomatic passports), Mongolia (diplomatic or official passports), Qatar (diplomatic or service passports), Russia (diplomatic passports) and Vietnam (diplomatic passports). Holders of diplomatic or service passports of any country have visa-free access to Cape Verde, Ethiopia, Mali and Zimbabwe. Where there is no French embassy, French citizens, as EU citizens, have the right to get consular protection from the embassy of any other EU country that has a presence. Despite what is written below, some countries on a bilateral basis allow French citizens to travel on expired passports. For example, Turkey allows holders of French passports to use passports that expired up to 5 years ago. Together with fingerprint and face recognition, iris scanning is one of three biometric identification technologies internationally standardised since 2006 by the International Civil Aviation Organization (ICAO) for use in e-passports and the United Arab Emirates conducts iris scanning on visitors who need to apply for a visa. ^ "Global Ranking - Passport Index 2019" (PDF). Henley & Partners. Retrieved 2 April 2019. ^ "Country information (visa section)". Timatic. International Air Transport Association (IATA) through Olympic Air. Retrieved 24 October 2018. ^ "Home Page - The Electronic Visa System of Azerbaijan Republic". evisa.gov.az. ^ Available at Shahjalal International Airport, Shah Amanat International Airport and Osmani International Airport only. ^ "Kingdom of Cambodia - Ministry of Foreign Affairs & International Cooperation". Evisa.mfaic.gov.kh. 2014-05-15. Archived from the original on 2014-07-28. Retrieved 2014-07-23. ^ "Electronic Travel Authorization (eTA) - Canada.ca". www.canada.ca. ^ Canada, Immigration, Refugees and Citizenship. "Entry requirements by country/territory - Canada.ca". www.canada.ca. ^ "Flying to Canada? Entry rules are changing. - Air Saint-Pierre". 4 November 2015. ^ a b c Extendable length of stay. ^ "Egypt e-Visa Portal". Ministry of Interior (Egypt). Retrieved 3 December 2017. ^ "Iran extends airport visa validity to 30 days". 3 August 2015. ^ "Visa Information". Timatic. Retrieved 26 November 2013. 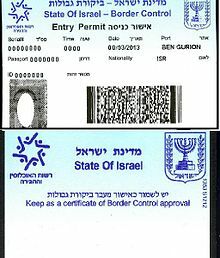 ^ Visa on arrival obtainable at most international ports of entry and at most international land border crossings (except King Hussein/Allenby Bridge crossing). ^ "The citizens of 83 countries to visit Kazakhstan without visas since 2017". primeminister.kz. ^ eCitizen. "eCitizen - Gateway to All Government Services". immigration.ecitizen.go.ke. ^ "You are being redirected..." evisa.moi.gov.kw. ^ "Mozambique Government Announces 30-day Tourist Visas now Available at Borders for all Visitors - Mozambican Hotels". www.mozambicanhotels.com. ^ "Myanmar eVisa". Archived from the original on 2012-02-08. Retrieved 2012-02-08. ^ Obtainable at Tribhuvan International Airport and certain land borders. ^ "Business Visa. Ministry of Interior of Pakistan". ^ "Group Tourism through Designated Tour Operators". ^ "REQUERIMIENTOS DE VISAS PARA CIUDADANOS EXTRANJEROS" (PDF). Archived from the original (PDF) on 2016-02-04. Retrieved 2016-01-29. ^ "Agreement between the European Community and the Republic of Seychelles on the short-stay visa waiver". EUR-Lex. Official Journal of the European Union. 30 June 2009. Retrieved 27 December 2015. ^ "Agreement - Consilium". www.consilium.europa.eu. ^ a b "From Rep. of Turkey Ministry of Foreign Affairs". Republic of Turkey Ministry of Foreign Affairs. Archived from the original on 2015-10-08. Retrieved 2016-05-04. ^ "EU signs visa waiver agreement with the United Arab Emirates - Consilium". www.consilium.europa.eu. ^ "Citizen of Visa Waiver Country, wants to drive into U.S. from Canada or Mexico, or arrive at a port of call in the U.S. by cruise ship". help.cbp.gov. ^ "Аҧсны Аҳәынҭқарра Адәныҟатәи Аускәа Рминистрра". Mfaapsny.org. Archived from the original on 2017-06-23. Retrieved 2014-07-23. ^ "The Friends of Mount Athos - A Pilgrim's Guide to Mount Athos: Planning Your Visit". Athosfriends.org. 2007-11-06. Retrieved 2014-07-23. ^ "Mount Athos Info, Αγιον Οροσ, Berg Athos, Ouranoupolis, Ουρανουπολη". Mountathosinfos.gr. Archived from the original on 2007-12-01. Retrieved 2014-07-23. ^ "Visa-free travel time up to ten days in parts of Brest Oblast, Grodno Oblast as from 1 January". Eng.belta.by. Retrieved 2018-07-26. ^ "Foreigners Now Need Russian Visa to Visit Crimea". ^ Korinia Estate Agency, North Cyprus. "Northern Cyprus, Living in North Cyprus, Postal System, Passports and Visa". Korinia.com. Retrieved 2014-07-23. ^ "How to get to North Cyprus? - Passport, Visa & Entry Requirements". Cypnet.co.uk. Retrieved 2014-07-23. ^ "Buffer Zone Permits". Unficyp. Archived from the original on 2014-10-21. Retrieved 2014-07-23. ^ a b "Denmark travel advice". GOV.UK. Retrieved 2014-07-23. ^ "Do I require an entry clearance/ VISA". Archived from the original on 2013-12-02. Retrieved 2018-05-09. ^ "An overview of Immigration in the Isle of Man". Archived from the original on 2013-11-23. Retrieved 2018-05-09. ^ Jan Mayen Crew. "Jan Mayen Homesite, Edited By The Jan Mayen Crew". Jan-mayen.no. Retrieved 2014-07-23. ^ "Lovdata - Sender deg til riktig side". Lovdata.no. 1962-06-01. Retrieved 2014-07-23. ^ Jersey, States of. "Visa and passport requirements for visitors". www.gov.je. ^ "Special Categories - Ministry of Foreign Affairs - Kosovo". Mfa-ks.net. Retrieved 2014-07-23. ^ "The procedure of foreign citizens' entry to the NKR - NKR". Nkr.am. 2004-04-14. Retrieved 2014-07-23. ^ "The Office of the Nagorno Karabakh Republic in USA". Nkrusa.org. Retrieved 2014-07-23. ^ "Azərbaycan Respublikası Xarici İşlər Nazirliyi - Azərbaycan Respublikasının Xarici İşlər Nazirliyi Azərbaycan Respublikasının vətəndaşlarına Liviyada mövcud olan vəziyyətlə bağlı xəbərdarlıq edir, 12 may 2011-ci il". Mfa.gov.az. 2011-05-12. Retrieved 2014-07-23. ^ "Ukraine imposes passport control on rebel-held regions". 6 November 2014. ^ "О визах | Министерство иностранных дел". Mfa-rso.su. 2010-04-22. Retrieved 2014-07-23. ^ "Procedure of the Entry to the Territory of the Republic of South Ossetia | Министерство иностранных дел". Mfa-rso.su. Retrieved 2014-07-23. ^ "Rules and recommendations". Transnistria tour. Retrieved 2014-07-23. ^ "British Indian Ocean Territory travel advice - GOV.UK". Fco.gov.uk. 2014-03-13. Retrieved 2014-07-23. ^ Hans van der Splinter (2013-01-27). "Ministry of Tourism - Tourism Service Center". Eritrea.be. Retrieved 2014-07-23. ^ "Useful info : St Helena Tourism". Sthelenatourism.com. Retrieved 2014-07-23. ^ "Tristan da Cunha Information for Visitors". Tristandc.com. Retrieved 2014-07-23. ^ "Practical travel information on Visas in Somaliland, Puntland & Somalia - Lonely Planet Travel Information". Lonelyplanet.com. Archived from the original on 2014-11-06. Retrieved 2014-07-23. ^ "Tajikistan-Visa". 27 April 2012. ^ "No visa required for tourists to Phu Quoc on short stay - Vietsea Tourist - Travel to Vietnam, Laos, Cambodia and Thailand - Vietnam Travel Tours". www.vietseatourist.vn. ^ "Aruba Country Specific Information". Bureau of Consular Affairs, U.S. Department of State. Archived from the original on 14 November 2013. Retrieved 19 November 2013. ^ "Bonaire, St. Eustatius, and Saba (BES) Country Specific Information". Bureau of Consular Affairs, U.S. Department of State. Archived from the original on 5 November 2013. Retrieved 19 November 2013. ^ "Montserrat Online Visa Application :: Government of Montserrat :: Home". www.immigration.ms. ^ "Sint Maarten Country Specific Information". Bureau of Consular Affairs, U.S. Department of State. Archived from the original on 3 December 2013. Retrieved 19 November 2013. ^ Entry Permit Waiver Program, Department of Legal Affairs of American Samoa. ^ "Immigration data" (PDF). www.government.pn. ^ "Sistema de Calificación y Control de Residencia - Consejo de Gobierno de Galápagos". Archived from the original on 2015-02-21. Retrieved 2017-06-29. ^ "Visit The Falkland Islands - Falklands". www.falklandislands.com. This page was last edited on 7 April 2019, at 22:45 (UTC).